Hubby's Birthday is on Monday and we are celebrating today! 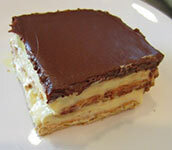 I made this very easy Chocolate Eclair Cake, AKA Ice box cake. I love this cake and it is so easy to make. Line a dish (13 x 9 x 2 in) with butter and layer with graham cracker sheets. In a mixing bowl on medium speed, blend together the milk and french vanilla pudding mix for 2 minutes. Next, fold in the whipped topping. Take half of your mixture and spread over the first layer of graham crackers. Place another layer of graham crackers on top of pudding mixture. Pour the remaining mixture on top of the second layer of crackers. Put a third and final layer of crackers on top. Heat the chocolate frosting in a microwave safe dish for one minute, stopping half way through to stir. Top evenly with the melted chocolate frosting. Chill over night for 24 hours.